Click here to see updated data for this state. 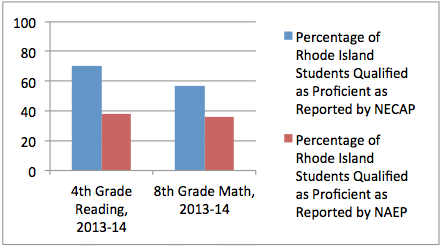 As with most states, discrepancies have emerged between student proficiency rates as reported by Rhode Island state tests and the National Assessment of Educational Progress (NAEP), most commonly called “the Nation’s Report Card.” For the 2013-14 school year, Rhode Island showed a 32-point discrepancy between state reported proficiency scores and NAEP in fourth-grade reading, and a 21-point discrepancy in eighth-grade math. In Rhode Island, the standard for proficiency and minimum score are set by state Education Commissioner and the State Board of Education. How Rhode Island is Working to Close the Honesty Gap: In 2010 Rhode Island adopted college- and career-ready standards in English Language Arts (ELA) and math (the Common Core State Standards). In the 2014-15 school year, Rhode Island chose to give the new PARCC test in order to have a more accurate understanding of students’ real-world critical thinking, math and writing skills. With the adoption of higher standards and aligned assessment, Rhode Island is well along on the road to becoming a top truth teller. Parents and educators will get new information this fall that will help them know the truth about how their child is doing – and how well their state is preparing kids for success after high school. States Leading the Way: More than half of all states demonstrated a 30-percentage point or more differential between their calculated proficiency rates and NAEP. Some states, such as Kentucky, Alabama, and Tennessee took early steps to correct the Honesty Gap with promising results. Kentucky previously had some of the nation’s largest gaps, but after adopting a new, high-quality assessment, became one of the “Top Truth Tellers” in eighth-grade math, narrowing a 32- percentage point discrepancy to 15 between 2011 and 2014. Additionally, between 2012 and 2014, the number of eleventh-grade students meeting college-readiness benchmarks on the ACT college entrance test increased by 15 percentage points.